Since November 2012 there is a Europe-wide labeling requirement for motor vehicle tyres (EU Regulation 1222/2009) – better known as the ‘EU Tyre Label’. 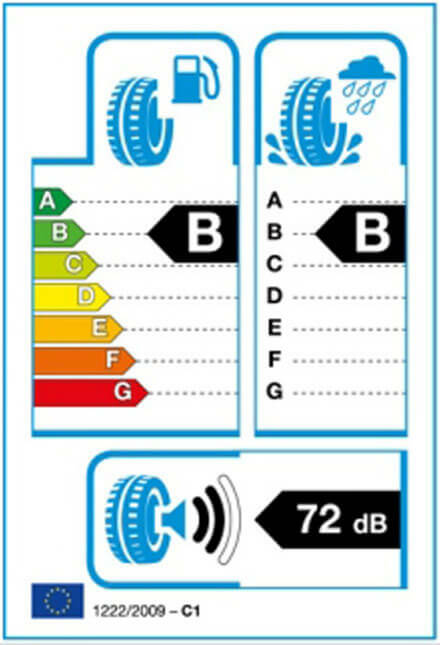 Written on this tyre label you will see information based on three performance criteria on the environmental and safety properties of the tyre. The fundamental aim of the tyre label is to give the consumer greater transparency in terms of road safety improvement, lower fuel consumption and lower noise emissions. To this end, there there are several rating classes. You may know these labelling criteria already from certain ‘white goods’ household appliances and when purchasing a new car. Who really likes the process of purchasing tyres? But when the time comes to buy a new tyre, you can now make a better informed decision quickly and objectively based on the EU tyre label. At a glance you have the three most important criteria for your new tyres in one simple view. Here at Z Tyre we welcome the introduction of the tyre label, we think you should be aware of the tyre’s performance criteria and understand how good the product is that you will need to trust on a daily basis. And in the end it could also be kind to your wallet! This diagram shows in incremental grades how well the the tyre brakes in wet conditions. Such wet grip performance is a key safety measurement in reducing accidents on our roads through poor tyre selection. The scale goes from A Grade green colour (best) down to G red colour (worst). The difference between an A label tyre and a G label tyre could possibly be a longer stopping distance of 18 metres in theory. New tyres produced today are not allowed to offer Class G as the rules have been tightened further since the introduction of EU regulation. Overall vehicle fuel efficency has a lot to do with the rolling resistance of the tyre A reduced rolling resistance saves fuel and reduces general CO² emissions. The grading again goes from A green colour (best) down to G red colour (worst). The difference between each class is theoretically a fuel reduction of 0.1 litres per 100 km. However, this technical result can vary by type of car, prevailing weather conditions and personal driving style. But it remains a good objective indicator. Copyright © Z Tyre. All rights reserved.